A beautiful, elegant bird. Iridescent green and purple head and crest. Two white lines, one supercilium (a strip above the eye like a long narrow eyebrow), and one just below extending back from the eye (post-ocular). Dark brown upper parts. Purple and green wings with a white band in the front. White throat. Chestnut breast with white spots. White underside. Red iris and eyelids. About 18 inches long. They call out a high pitched note somewhat like zipping a long plastic zipper with increasing speed. Also has a shorter squeak. They forage for acorns and aquatic plant seeds (wild oats and rice), roots, berries and insects. Nest in deep cavities of decaying trees at heights from within reach to over 60 feet in forested lowlands often over water or within a hundred feet more or less. Sometimes a pair occupies the same nest for several breeding seasons. Females lay around eight to twelve (but varies significantly) ivory colored eggs which hatch after about four to five weeks incubation. The day after the eggs all hatch, the parents coax the young ducklings to jump from the nest and while the male parent stands guard, the female parent leads the ducklings to water and they begin learning to forage. Young learn to fly at about two months of age. 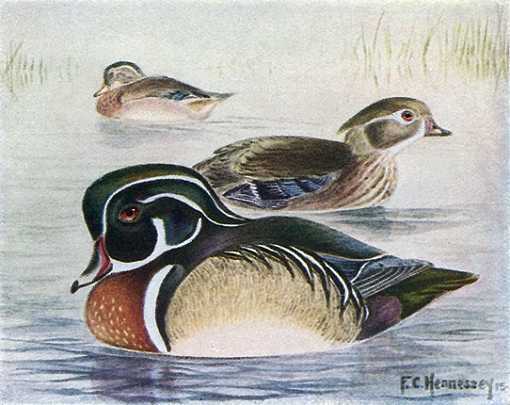 The Wood Duck Nest Box (same as for Hooded Merganser, and Kestrel) has a 10″ by 10″ floor, 24″ inside floor to ceiling, 4″ wide by 3″ high entrance hole located 21″ above the floor and ventilation openings in the floor and under the roof. A beautiful, elegant bird. Iridescent green and purple head and crest. Two white lines, one supercilium (a strip above the eye like a long narrow eyebrow), and one just below extending back from the eye (post-ocular). Dark brown upper parts. Purple and green wings with a white band in the front. White throat. Chestnut breast with white spots. White underside. Red iris and eyelids. About 18 inches long. 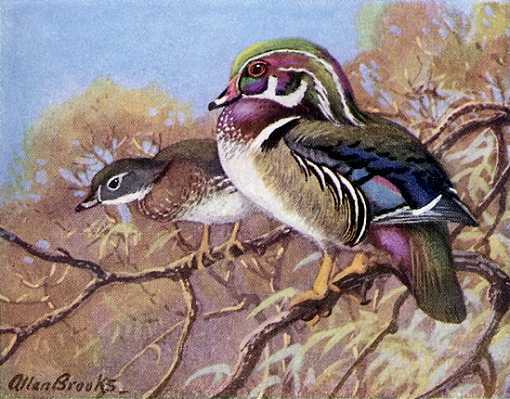 Wood ducks are abundant especially in woodlands near water throughout most of North America from the Hudson Bay region to Mexico and the Caribbean.